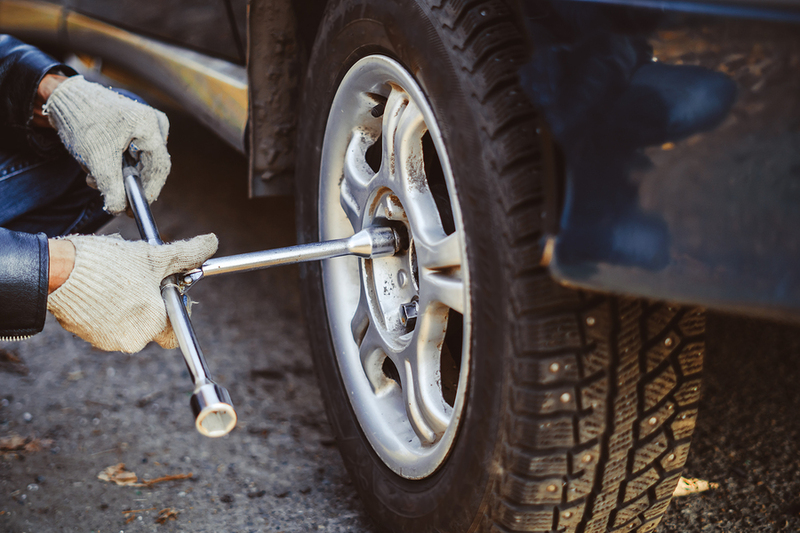 While changing a tire was a skill many had in days gone by, in recent years it has become less of a necessity and more of a “if I ever have the time to learn” topic. With the constant connectivity available from modern cell phones, a stranded driver is almost always able to make a call, or find someone who can. If you are ever in a situation where you have no signal – gasp, shudder! – and there is no one around who does, you will be grateful you read this quick how to! Changing your windshield wipers is sometimes more complicated than changing a tire! You should always know where your spare tire is located in your car, as well as your jack and other tools. If your jack uses a different tool than the lug nuts on your tires require, familiarize yourself with both tools, their appearance, and functionality. Check the state of your spare at least every time you change your oil, and if you have the good fortune to get a new car, verify the presence or lack of jack, tools, and intact spare before you drive away after your purchase. So, you’ve got a flat. When Changing a Tire, The first thing you should do is make your way to the shoulder, and preferably aim for a level section. Turn on your hazard lights, and engage your parking brake. It is also best if you can shut the engine off, but we understand that sometimes that is not as much of a good idea; if the temperatures are too cold or too hot, and you have other passengers in the vehicle, leave the car running for the climate control. If you have wheel wedges, sometimes called chocks or chock blocks, place them in front of and behind all tires, except the flat. Retrieve your car jack, spare tire, and lug wrench. This is why it comes in handy to familiarize yourself with these items, and their location in your vehicle, long before you ever need them. You will not want to be hunting for them, in the dark, on the side of a lonely road some terrible night. Before you jack the car up, to the point that the flat is clear of the ground, you should loosen the nuts on the flat while gravity can help you. If you were to attempt to break them loose when the wheel is raised up on high, the tire would spin around and around, rather than allowing the nuts to loosen. Locate your vehicle’s structurally-safe jack points. Don’t just place the jack under the bumper; if you do, you’ll need to say “bye-bye” to your bumper. If you are not familiar with your vehicle’s jack point locations, look in the owner’s manual. Tighten the bolt on the jack to ensure it is ready to lift, place the head of the lift-arm under the jack point, and pump away. Once the wheel is free of the ground, finish removing the lug nuts from the flat tire. Do NOT lose those lug nuts! Place them on the hood, in the door of the car, even on the hub cap cover, but whatever you do, keep them safe! Wiggle and lift the tire off the lug bolts, and set it aside. Lift the spare into place on the lug bolts, pushing it on as far as possible. Use those lug nuts and secure the tire in place. One trick is to alternate as you go; it helps to imagine your lug nuts as numbers on a clock face. If you have nuts at 2, 4, 7, 9, and 12 (similar to the five points of a star), it would be best to tighten 2, then 7, then 12, then 4, then 9. In this way, you are assured that you are tightening all sides of the tire evenly, and not leaving one side looser than another. If you tightened the nuts in a direct loop (12, 2, 4, 7, 9), you would be likely to have the right side of tire tighter than the left, because you got tired before you finished. Use the lug wrench to make them as tight as you can get without snapping something. Final step for Changing a Tire, Lower your car, gently, using the loosening bolt on your jack. Tighten all the lug nuts once more, using the lug wrench, and then put away your jack and other tools. Place the flat tire in the spare tire’s place in storage, and remove your chocks or rocks. Restart your car, and you’re ready to roll! Some notes for the road. If your spare tire is a small-size spare, sometimes referred to as a donut, be sure you do not travel too fast. Donuts have a tendency to wobble erratically at high speeds, and this can cause accidents if you are not careful. Donuts also are not meant for the long haul; the average donut can travel between 50 and 100 miles before it needs to be replaced. If you have a full-sized spare, you can travel as far as you need; just remember to replace the flat with a new tire as soon as possible, because what happens if you get a second flat? That’s right, you really would be stranded…. Not good. But now you know a skill not many do! Use it as your next party trick! Or not…. We leave that to your discretion.